A village of the Saura Indians, abandoned by that tribe in the early 18th century, was on Dan River, two mi. S.
Hernando de Soto made the first mention of the Saura Indians in journals dating from his exploration in 1540 of what would become North Carolina. At the time he encountered the Saura (also called Cheraw), they were living southeast of present-day Asheville in the village of Xuala. Sometime during the hundred years following the encounter with de Soto, the tribe relocated to present-day Rockingham and Stokes counties. Along the banks of the Dan River in Stokes County, the tribe built the village of Upper Saura Town, and thirty miles downstream in Rockingham County, near present-day Eden, Lower Saura Town. Along with the Keyauwee Tribe, the Saura Indians among the earliest inhabitants of Piedmont North Carolina and belong to the Siouan language group. 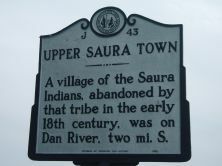 As a result of frequent attacks by Seneca Indians, a band within the Iroquois Confederacy, the Saura left Upper Saura Town and Lower Saura Town villages in 1710 and moved southeast to join the Keyauwee Tribe. Colonists began to complain about the proximity of Indians to them and asked the colonial government for protection. From their location along the upper Pee Dee River near the North Carolina South Carolina border, the Saura were reported to be committing atrocities against the white settlers. North Carolina’s Governor Charles Eden and the South Carolina government declared war against the Saura as part of the Yamassee War. By the end of the war in 1718, their total population, probably including the Keyauwee, had shrunk from 1,200 (estimated in 1600) to 510. The Saura continued to suffer attacks from the Iroquois and were obliged to incorporate with their previous enemy, the Catawba tribe. In 1768, survivors numbered only fifty or sixty. While surveying land around the North Carolina-Virginia border in 1728, William Byrd came across the deserted Upper and Lower Saura villages. His 1733 map was the first to document the villages. Byrd was so impressed with the beauty of the place that he went back later and purchased 26,000 acres of land in the area. Upper Saura Town became the Stokes County community Sauratown, which existed until 1894. 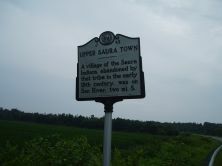 The Saura name can still be found in the Suwali Gap in the Blue Ridge Mountains, the Saura Town Mountains in Stokes County, and Cheraw, South Carolina. The Dan River is named for an early Saura chief, Danapha.